The starting point of the our stubby pencil is the rectangle, the pencil is made up of individual rectangles which will transform into the pencil. Select the “Rectangle Tool” (U) then create a rectangle for the lead and then a rectangle for the wood part. After the wood part create 3 rectangles on top of each other which will form the main part of the pencil, then finally create two more rectangles for the metal rubber holder then lastly the rubber. This step will become more clear in the image below. Select the black rectangle layer which will be our nib then go to “Edit > Transform > Perspective”. Select the left corner anchor point then drag downwards until the end of the rectangle becomes a point. Select the next rectangle layer which is the wood part of the pencil and repeat the step, go to “Edit > Transform > Perspective” then select the left corner anchor point and drag downwards. With the wood part you need to match the height of the right side of the nib. As you can see our rectangles look more like a pencil even at this early stage. Select the metal part of the pencil then go to “Edit > Transform > Warp”. With the warp tool selected select and drag the middle left side of the rectangle then drag inwards, the rectangle should start to curve. Repeat this step for the other side of the metal part so that both sides of the rectangle are curved. Select the rubber layer then repeat the step above only this time just curve the end of the rectangle. Select the pencils wood layer then add a “Gradient Overlay” using the settings below. Select the metal bar of the pencil then add the following layer styles. Finally add a “Gradient Overlay” to the rubber layer using the following settings. Create a new layer above all your other layers then select the “Rectangle Tool” (U), make a white #ffffff rectangle which covers the bottom half of the lead and wood part of the pencil. Now go to “Edit > Transform > Distort”, with the distort tool selected select the bottom left anchor point then drag it upwards towards the top left anchor point. Once your happy set the layers opacity to 28%. Using the “Rectangle Tool” (U) create to horizontal rectangles over the top of the middle pencil rectangle and the bottom rectangle, again lower the opacity, you should have something like this. On the rubber select the “Ellipse Tool” (U) then make two small blurred “Filter > Blur > Guassian Blur” ellipses. Set the ellipses blend mode to soft light, you should have something like the image below. Finally, still on the rubber create two white #ffffff lines, one of the top and on the right side of the rubber. Blur the two lines using the guassian blur “Filter > Blur > Guassian Blur”. Duplicate the metal layer then right click the duplicated layer and select “Clear Layer Styles” from the fly out menu. Once the layer styles have been cleared drag the duplicated layer underneath the original. Now go to “Filter > Blur > Guassian Blur” blur the shape by around d 2-3 pixels. Now, select all your pencil layers then right click and go to “Duplicate Layers”, with all your layers still selected right click once more and select “Merge Layers”. Now that you have the pencil all on one layer add a “Color Overlay” to the layer using the color black #000000. Select the “Move Tool” (V) then shift the shadow down a couple of pixels then go to “Filter > Blur > Guassian Blur” blur the shape by around 3-4 pixels. Finally drag the shadow layer to the bottom of your stack. On top of the metal layer add 3 white shapes similar to the image below. Right click the metal layer and select “Copy Layer Styles” then right click each of the shape layers and select “Paste Layer Styles”. Once you’ve have pasted the layer styles double click each layer to open the layer styles window, select the gradient overlay and change the “Scale” to “90%”. Select the “Rounded Rectangle Tool” (U) then drag out a rectangle over the middle part of the pencil. Using the color #f2b261 add some text inside of the rectangle. That’s it your all done, you should now have a basic idea on how to create a pencil, you could improve the image a bit by changing the pencils perspective and maybe adding some squiggling lines. This is simple but an amazing technique. Cheers Man. Nice job! greeting from venezuela! Great tutorial, thanks for this easy to follow tutorial. Hi！It’s excellent！ I’m a Chinese girl !Nice to meet you ,Richard Carpenter! This tutorial is so helpful..love it. Nice tutorials and very useful vectors, i am very thanks such an beautiful vectors collections with their in depth explanation.i hope in future also u will add some more collections, i am really thanks your contribution towards world designers community. Pencil tutorials veryyyyyyyyy veryyyyyyyyyy nice. Photoshop. I will be very great full to you. it is a creative work ,I have done.very nice. Hi mate, thanks a lot for the tutorial ! Could you tell how you manage to rotate the pencil without degrading the quality of it? On the very last picture that is. wow! 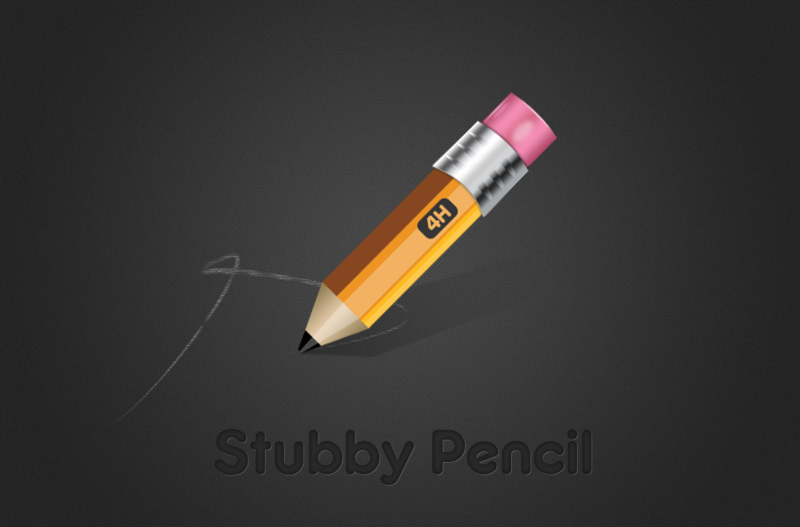 wonderful photoshop tutorial for create a Stubby Pencil In Photoshop.I have impressed and this is helpful for me .thanks for step by step process.keep it up!!! !